The WS-AtomicTransaction specification provides the definition of the Atomic Transaction coordination type that is to be used with the extensible coordination framework described in WS-Coordination. This specification defines three specific agreement coordination protocols for the Atomic Transaction coordination type: completion, volatile two-phase commit, and durable two-phase commit. Developers can use any or all of these protocols when building applications that require consistent agreement on the outcome of short-lived distributed activities that have the all-or-nothing property. Technical Committee members should send comments on this specification to the Technical Committee’s email list. Others should send comments to the Technical Committee by using the “Send A Comment” button on the Technical Committee’s web page at www.oasis-open.org/committees/ws-tx . For information on whether any patents have been disclosed that may be essential to implementing this specification, and any offers of patent licensing terms, please refer to the Intellectual Property Rights section of the Technical Committee web page (www.oasis-open.org/committees/ws-tx/ipr.php ). The non-normative errata page for this specification is located at www.oasis-open.org/committees/ws-tx . The current set of Web service specifications [WSDL][SOAP11][SOAP12] defines protocols for Web service interoperability. Web services increasingly tie together a number of participants forming large distributed applications. The resulting activities may have complex structure and relationships. WS-Coordination [WSCOOR] defines an extensible framework for defining coordination types. This specification provides the definition of an Atomic Transaction coordination type used to coordinate activities having an "all or nothing" property. Atomic transactions commonly require a high level of trust between participants and are short in duration. WS-AtomicTransaction defines protocols that enable existing transaction processing systems to wrap their proprietary protocols and interoperate across different hardware and software vendors. · The reader is familiar with existing standards for two-phase commit protocols and with commercially available implementations of such protocols. Therefore this section includes only those details that are essential to understanding the protocols described. · The reader is familiar with WS-Coordination [WSCOOR] which defines the framework for the Atomic Transaction coordination protocols. · The reader is familiar with WS-Addressing [WSADDR] and WS-Policy [WSPOLICY]. Atomic transactions have an all-or-nothing property. The actions taken by a transaction participant prior to commit are only tentative; typically they are neither persistent nor made visible outside the transaction. When an application finishes working on a transaction, it requests the coordinator to determine the outcome for the transaction. The coordinator determines if there were any processing failures by asking the participants to vote. If the participants all vote that they were able to execute successfully, the coordinator commits all actions taken. If a participant votes that it needs to abort or a participant does not respond at all, the coordinator aborts all actions taken. Commit directs the participants to make the tentative actions final so they may, for example, be made persistent and be made visible outside the transaction. Abort directs the participants to make the tentative actions appear as if they never happened. Atomic transactions have proven to be extremely valuable for many applications. They provide consistent failure and recovery semantics, so the applications no longer need to deal with the mechanics of determining a mutually agreed outcome decision or to figure out how to recover from a large number of possible inconsistent states. This specification defines protocols that govern the outcome of Atomic Transactions. It is expected that existing transaction processing systems will use WS-AtomicTransaction to wrap their proprietary mechanisms and interoperate across different vendor implementations. By using the XML [XML], SOAP [SOAP11] [SOAP12] and WSDL [WSDL] extensibility model, SOAP-based and WSDL-based specifications are designed to work together to define a rich Web services environment. As such, WS-AtomicTransaction by itself does not define all features required for a complete solution. WS-AtomicTransaction is a building block used with other specifications of Web services (e.g., WS-Coordination [WSCOOR], WS-Security [WSSec]) and application-specific protocols that are able to accommodate a wide variety of coordination protocols related to the coordination actions of distributed applications. The uppercase key words “MUST”, “MUST NOT”, “REQUIRED”, “SHALL”, “SHALL NOT”, “SHOULD”, “SHOULD NOT”, “RECOMMENDED”, “MAY”, and “OPTIONAL” in this document are to be interpreted as described in RFC2119 [RFC2119]. This MUST also be used as the CoordinationContext type for Atomic Transactions. Dereferencing the XML namespace defined in section 1.3 will produce the Resource Directory Description Language (RDDL) [RDDL] document that describes this namespace, including the XML schema [XML-Schema1] [XML-Schema2] and WSDL [WSDL] declarations associated with this specification. [WSPOLICYATTACH] Web Services Policy 1.2 – Attachment (WS-PolicyAttachment), http://www.w3.org/Submission/2006/SUBM-WS-PolicyAttachment-20060425/, W3C Member Submission, 25 April 2006. WS-AtomicTransaction builds on WS-Coordination [WSCOOR], which defines an Activation service, a Registration service, and a CoordinationContext type. Example message flows and a complete description of creating and registering for coordinated activities is found in WS-Coordination [WSCOOR]. The Atomic Transaction coordination context is a CoordinationContext type with the coordination type defined in this section. Atomic Transaction application messages that propagate a coordination context MUST use an Atomic Transaction coordination context. If these application messages use a SOAP binding, the Atomic Transaction coordination context MUST flow as a SOAP header in the message. · If the request includes the CurrentContext element, the target coordinator is interposed as a subordinate to the coordinator stipulated inside the CurrentContext element. · If the request does not include a CurrentContext element, the target coordinator creates a new transaction and acts as the root. A coordination context MAY have an Expires element. This element specifies the period, measured from the point in time at which the context was first created or received, after which a transaction MAY be terminated solely due to its length of operation. From that point forward, the coordinator MAY elect to unilaterally roll back the transaction, so long as it has not made a commit decision. Similarly a 2PC participant MAY elect to abort its work in the transaction so long as it has not already decided to prepare. · Completion: The completion protocol initiates commit processing. Based on each protocol's registered participants, the coordinator begins with Volatile 2PC and then proceeds through Durable 2PC. The final result is signaled to the initiator. o Volatile 2PC: Participants managing volatile resources such as a cache register for this protocol. o Durable 2PC: Participants managing durable resources such as a database register for this protocol. A participant MAY register for more than one of these protocols. 1. The source SHOULD have knowledge of the destination's policies, if any, and the source SHOULD be capable of formulating messages that adhere to this policy. 2. If a secure exchange of messages is required, then the source and destination MUST have appropriate security credentials (such as transport-level security credentials or security tokens) in order to protect the messages. The Completion protocol is used by an application to tell the coordinator to either try to commit or abort an Atomic Transaction. After the transaction has completed, a status is returned to the application. A Completion protocol coordinator MUST be the root coordinator of an Atomic Transaction. The Registration service for a subordinate coordinator MUST respond to an attempt to register for this coordination protocol with the WS-Coordination fault Cannot Register Participant. The diagram below illustrates the protocol abstractly. Refer to section 9 State Tables for a detailed description of this protocol. Upon receipt of this notification, the coordinator knows that the initiator has completed application processing. A coordinator that is Active SHOULD attempt to commit the transaction. Upon receipt of this notification, the coordinator knows that the initiator has terminated application processing. A coordinator that is Active MUST abort the transaction. Upon receipt of this notification, the initiator knows that the coordinator reached a decision to commit. Upon receipt of this notification, the initiator knows that the coordinator reached a decision to abort. A coordination service that supports an Activation service MUST support the Completion protocol. The Two-Phase Commit (2PC) protocol is a Coordination protocol that defines how multiple participants reach agreement on the outcome of an Atomic Transaction. The 2PC protocol has two variants: Volatile 2PC and Durable 2PC. Upon receiving a Commit notification in the Completion protocol, the root coordinator begins the prepare phase of all participants registered for the Volatile 2PC protocol. All participants registered for this protocol MUST respond before a Prepare is issued to a participant registered for Durable 2PC. Further participants MAY register with the coordinator until the coordinator issues a Prepare to any durable participant. Once this has happened the Registration Service for the coordinator MUST respond to any further Register requests with a Cannot Register Participant fault message. A volatile recipient is not guaranteed to receive a notification of the transaction's outcome. Upon successfully completing the prepare phase for Volatile 2PC participants, the root coordinator begins the prepare phase for Durable 2PC participants. All participants registered for this protocol MUST respond Prepared or ReadOnly before a Commit notification is issued to a participant registered for either protocol. Upon receipt of this notification, the participant knows to enter phase one and vote on the outcome of the transaction. A participant that is Active MUST respond by sending Aborted, Prepared, or ReadOnly notification as its vote. If the participant does not know of the transaction, it MUST send an Aborted notification. If the participant knows that it has already voted, it MUST resend the same vote. Upon receipt of this notification, the participant knows to abort and forget the transaction. A participant that is not Committing MUST respond by sending an Aborted notification and SHOULD then forget all knowledge of this transaction. If the participant does not know of the transaction, it MUST send an Aborted notification to the coordinator. Upon receipt of this notification, the participant knows to commit the transaction. This notification MUST only be sent after phase one and if the participant voted to commit. If the participant does not know of the transaction, it MUST send a Committed notification to the coordinator. Upon receipt of this notification, the coordinator knows the participant is Prepared and votes to commit the transaction. Upon receipt of this notification, the coordinator knows the participant votes to commit the transaction, and has forgotten the transaction. The participant does not wish to participate in phase two. Upon receipt of this notification, the coordinator knows the participant has aborted and forgotten the transaction. Upon receipt of this notification, the coordinator knows the participant has committed and forgotten the transaction. Conforming implementations MUST implement the 2PC protocol. WS-Policy Framework [WSPOLICY] and WS-Policy Attachment [WSPOLICYATTACH] collectively define a framework, model and grammar for expressing the capabilities, requirements, and general characteristics of entities in an XML Web services-based system. To enable a Web service to describe transactional capabilities and requirements of a service and its operations, this specification defines an Atomic Transaction policy assertion that leverages the WS-Policy [WSPOLICY] framework. The Atomic Transaction policy assertion is provided by a Web service to qualify the transactional processing of messages associated with the particular operation to which the assertion is scoped. It indicates whether a requester MAY or MUST include an Atomic Transaction coordination context flowed with the message. A policy assertion that specifies that an Atomic Transaction coordination context MUST be flowed inside a requester’s message. From the perspective of the requester, the target service that processes the transaction MUST behave as if it had participated in the transaction. For application messages that use a SOAP binding, the Atomic Transaction coordination context MUST flow as a SOAP header in the message. Per WS-Policy [WSPOLICY], this is compact notation for two policy alternatives, one with and one without the assertion. Because the Atomic Transaction policy assertion indicates Atomic Transaction behavior for a single operation, the assertion has an Operation Policy Subject [WSPOLICYATTACH]. · wsdl:portType/wsdl:operation – A policy expression containing the Atomic Transaction policy assertion MUST NOT be attached to a wsdl:portType; the Atomic Transaction policy assertion specifies a concrete behavior whereas the wsdl:portType is an abstract construct. · wsdl:binding/wsdl:operation – A policy expression containing the Atomic Transaction policy assertion SHOULD be attached to a wsdl:binding. Lines 8-11 are a policy expression that includes an Atomic Transaction policy assertion (line 9) to indicate that an Atomic Transaction in WS-Coordination [WSCOOR] format MAY be used. Lines 13-19 are a WSDL [WSDL] binding. Line 16 indicates that the policy in lines 8-11 applies to this binding, specifically indicating that an Atomic Transaction MAY flow inside messages. The protocol faults defined in this section are generated if the condition stated in the preamble is met. These faults are targeted at a destination endpoint according to the protocol fault handling rules defined for that protocol. This fault is sent by a participant or coordinator to indicate that a protocol violation has been detected after it is no longer possible to change the outcome of the transaction. This is indicative of a global consistency failure and is an unrecoverable condition. [Reason] A global consistency failure has occurred. This is an unrecoverable condition. This fault is sent by a coordinator to indicate that it has no knowledge of the transaction and consequently cannot convey the outcome. [Reason] The coordinator has no knowledge of the transaction. This is an unrecoverable condition. The security model for Atomic Transactions builds on the model defined in WS-Coordination [WSCOOR]. That is, services have policies specifying their requirements and requestors provide claims (either implicit or explicit) and the requisite proof of those claims. Coordination context creation establishes a base secret which can be delegated by the creator as appropriate. Because Atomic Transactions represent a specific use case rather than the general nature of coordination contexts, additional aspects of the security model can be specified. All access to Atomic Transaction protocol instances is on the basis of identity. The nature of transactions, specifically the uncertainty of systems means that the security context established to register for the protocol instance may not be available for the entire duration of the protocol. Consider, for example, the scenarios where a participant has committed its part of the transaction, but for some reason the coordinator never receives acknowledgement of the commit. The result is that when communication is re-established in the future, the coordinator will attempt to confirm the commit status of the participant, but the participant, having committed the transaction and forgotten all information associated with it, no longer has access to the special keys associated with the token. There are, of course, techniques to mitigate this situation but such options will not always be successful. Consequently, when dealing with Atomic Transactions, it is critical that identity claims always be proven to ensure that correct access control is maintained by coordinators. The "list" of authorized participants ensures that application messages having a coordination context are properly authorized since altering the coordination context ID will not provide additional access unless (1) the bootstrap key is provided, or (2) the requestor is on the authorized participant "list" of identities. It is strongly RECOMMENDED that the communication between services be secured using the mechanisms described in WS-Security [WSSec]. In order to properly secure messages, the body and all relevant headers need to be included in the signature. Specifically, the <wscoor:CoordinationContext> header needs to be signed with the body and other key message headers in order to "bind" the two together. It should be noted that the mechanisms listed above are independent of the Security Context Token (SCT) and secret returned when the coordination context is created. That is, the keys used to secure the channel may be independent of the key used to prove the right to register with the activity. · Authentication – Authentication is established using the mechanisms described in WS-Security and WS-Trust [WSTrust]. Each message is authenticated using the mechanisms described in WS-Security [WSSec]. · A notification message is a terminal message when it indicates the end of a coordinator/participant relationship. Committed, Aborted and ReadOnly are terminal messages, as are the protocol faults defined in this specification and in WS-Coordination [WSCOOR]. · A notification message is a non-terminal message when it does not indicate the end of a coordinator/participant relationship. 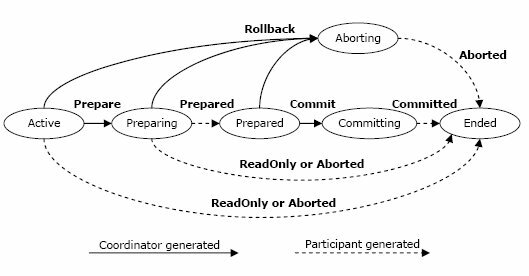 Commit, Rollback, Prepare and Prepared are non-terminal messages. · MUST include a [source endpoint] property whose [address] property is not set to ‘http://www.w3.org/2005/08/addressing/anonymous’ or 'http://www.w3.org/2005/08/addressing/none’. · MUST include a [reply endpoint] property whose [address] property is set to 'http://www.w3.org/2005/08/addressing/none’. Notification messages are normally addressed according to section 3.3 of WS-Addressing 1.0 – Core [WSADDR] by both coordinators and participants using the Endpoint References initially obtained during the Register-RegisterResponse exchange. If a [source endpoint] property is present in a notification message, it MAY be used by the recipient. Cases exist where a Coordinator or Participant has forgotten a transaction that is completed and needs to respond to a resent protocol message. In such cases, the [source endpoint] property SHOULD be used as described in section 3.3 of WS-Addressing 1.0 – Core [WSADDR]. Permanent loss of connectivity between a coordinator and a participant in an in-doubt state can result in data corruption. Protocol faults raised by a Coordinator or Participant during the processing of a notification message are terminal notifications and MUST be composed using the same mechanisms as other terminal notification messages. All messages are delivered using connections initiated by the sender. The following state tables specify the behavior of coordinators and participants when presented with protocol messages or internal events. Each state supports a number of possible events. Expected events are processed by taking the prescribed action and transitioning to the next state. Unexpected protocol messages MUST result in a fault message as defined in the state tables. These faults use standard fault codes as defined in either WS-Coordination [WSCOOR] or in section 5 Transaction Faults. Events that may not occur in a given state are labeled as N/A. 1. Transitions with a “N/A” as their action are inexpressible. A TM should view these transitions as serious internal consistency issues that are likely fatal conditions. 2. The "Internal events" shown are those events, created either within a TM itself or on its local system, that cause state changes and/or trigger the sending of a protocol message. These tables present the view of a coordinator or participant with respect to a single partner. A coordinator with multiple participants can be understood as a collection of independent coordinator state machines, each with its own state. This document is based on initial contributions to the OASIS WS-TX Technical Committee by the following authors: Luis Felipe Cabrera (Microsoft), George Copeland (Microsoft), Max Feingold (Microsoft), Robert W Freund (Hitachi), Tom Freund (IBM), Jim Johnson (Microsoft), Sean Joyce (IONA), Chris Kaler (Microsoft), Johannes Klein (Microsoft), David Langworthy (Microsoft), Mark Little (Arjuna Technologies), Frank Leymann (IBM), Eric Newcomer (IONA), David Orchard (BEA Systems), Ian Robinson (IBM), Tony Storey (IBM), Satish Thatte (Microsoft). The following individuals have provided invaluable input into the initial contribution: Francisco Curbera (IBM), Doug Davis (IBM), Gert Drapers (Microsoft), Don Ferguson (IBM), Kirill Gavrylyuk (Microsoft), Dan House (IBM), Oisin Hurley (IONA), Thomas Mikalsen (IBM), Jagan Peri (Microsoft), John Shewchuk (Microsoft), Stefan Tai (IBM).